French sculptor. He was Professeur and later Doyen of the Acadmie de St Luc in Paris and is sometimes confused in contemporary documents with the sculptor Pierre Granier (1635-1715). Garnier was a bronze specialist employed by Franois Girardon to repair the waxes bronzes at the Paris Arsenal from 1686 to 1692. He was also responsible for such small bronze groups and statuettes as Paetus and Arria (1696-97; Paris, Louvre) and Bacchus (before 1699). He also executed funerary monuments in bronze and marble, including the monument for the brain of James II of England (1703; fragments, Paris, former Collège des Ecossais, 65 Rue Cardinal-Lemoine), the tomb of Maximilien Titon du Tillet (after 1711; destroyed) for the chapel of the convent of the Hospitalières at St Mand and the tomb for the heart of Louis-Franois, Marchal de Boufflers (1713; fragments, Crillon, Oise, parish church). 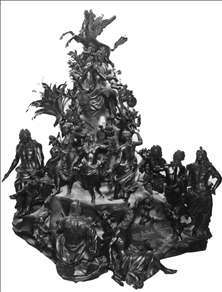 His best-known work, however, is the remarkable and strikingly original Parnasse franais (1718-21; Versailles, Chteau), an elaborate bronze group, over 2 m high, commissioned by Evrard Titon du Tillet and celebrating artists, musicians and writers of the reign of Louis XIV. The King, in the guise of Apollo and seated on top of Mt Parnassus, is surrounded by the three Graces, personified by the poets Antoinette Deshoulières, Henriette de La Suze and Madeleine de Scudry. Below are statuettes of Corneille, Racine, Molière, Lully, La Fontaine etc. Other notable figures are represented by portrait medallions. Titon later commissioned Augustin Pajou to add Jean-Jacques Rousseau, Prosper Crbillon and Voltaire. Apart from the Parnasse, however, few works by the strongly classical Garnier have survived, and the information about him is disappointingly fragmentary. See more details about "Parnasse français"